Join us for a family friendly event including a delicious luncheon, tea, activities, music, games, prizes donated by local businesses, and more! Don’t forget to bring your spring hat. 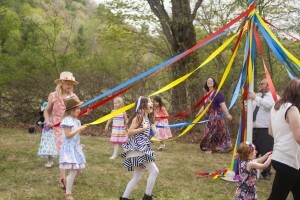 You won’t want to miss the cupcake decorating bar, the photo booth, and the maypole dancing! Soprano Angela Biggs and Pianist Kirsten Becker will perform a festive mix of music, and WCCMA students will perform. Thank you to Century 21 Highview Realty for sponsoring music for this event. Doors open at 12, and the event officially begins at 12:30pm. Previously years we have sold out of tickets, so make sure to buy yours early! You are not required to purchase through Eventbrite, but you must pay in advance in order to reserve your seat/table for the event. Contact us at melissa@wcc-ma.org for alternate options or questions.